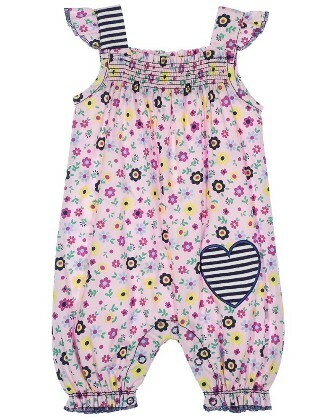 Woven rompers are a pretty summer choice for baby girls. Inspired by British Meadows, the ditsy floral print woven fabric is mixed back with contrast stripe trims for that L+S twist. Soft smocking to chest and legs for a fashion fit. Popper fastening to legs for easy dressing.